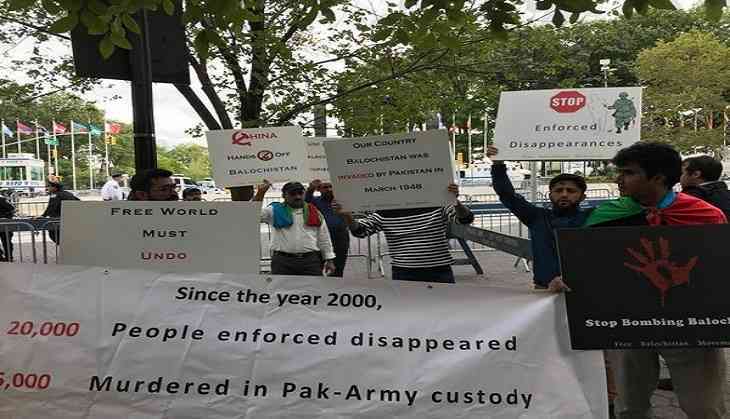 People from Balochistan staged a protest outside the United Nations headquarters to highlight the alleged human rights violations by Pakistan and urged the UN to intervene in the matter. Speaking to ANI, one protestor said, "We would like to ask the UN why it has failed to stop human rights violation and genocide of masses. Pakistan is violating the UN rules for years. Why has the UN failed to take action against Pakistan?" "Today's protest is about telling the UN that Baloch has been at the receiving end of Pakistan's violation of human rights for several years. We want to tell the UN about this. UN should send a fact-finding team to Balochistan," another protestor added. Few of the protestors also urged Prime Minister Narendra Modi to fulfil the promises that he made to Baloch people to free them from Pakistan's occupancy and atrocities. The issue was also raked up at the 39th Session of the UN Human Rights Council in Geneva, where Baloch political and human rights activists accused Islamabad of depleting Balochistan's resources by allowing Beijing to build the China-Pakistan Economic Corridor (CPEC) project through the region. Hatim Baloch of the Human Rights Council of Balochistan also accused the Imran Khan led-Government in Pakistan of instigating violence in Balochistan. "The main issue is the enforced disappearances, the military operations and the killing of our people. Unfortunately, these are the main human rights violations which we have been facing since the Pakistani occupation. The situation is getting worse day by day since 2004-05, and the Chinese investments have made the situation more complex," he said.